Charles Montesquieu coined the term "checks and balances." Checks and balances refers to a mechanism designed to limit power a single individual or body of government and provide for the harmonious interrelationship of the people and all of the organs of government or other social institutions. Checks and balances are intended to allow legitimate power to govern and good ideas to be implemented, while abuse of power, corruption, and oppression are minimized. 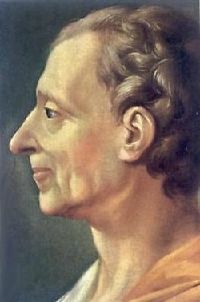 The phrase "checks and balances" was coined by Charles Montesquieu. The actual practice of checks and balances goes back in history much further. In the Ancient Roman Republic, the Roman Senate made up of the wealthy class was checked by the veto power Tribunes, who were charged with protecting the interests of the plebeians. In the Holy Roman Empire, the Church became a moral check against the absolute power of the temporal rulers. The Magna Carta was an agreement by which English Lords were able to check the absolute power of the King. Protestantism served as a check on the monopoly on spiritual power held by the Roman church. Checks and balances are important for all social institutions, including religious institutions, corporations, NGOs, and partnerships. In any of these institutions, there is opportunity for one person to use their power to gain something at the expense of another. Financial audits, dual signers on checks, and appointment of CEOs by corporate boards are examples of checks and balances in the non-political sphere. Modern political theory, beginning with Machiavelli and Hobbes, has sought to understand power, whereas classical political theory concentrated on justice. Montesquieu proposed separation of powers between an executive, a legislature, and a judiciary. Under this model, each branch has separate and independent powers and areas of responsibility; however, each branch is also able to place limits on the power exerted by the other branches. The Constitution of the United States was one of the first attempts to design a government based on an analysis of both power and justice. Checks and balances on power must be vigilantly watched. In the United States, for example, many abuses of power developed historically, some of which have been corrected by law, others which have developed because of changing social conditions the framers of the United States constitution did not envision, and still others where laws have been changed to allow the unchecked power of a select few to expand. One of the most visible problems is the growth of corporate wealth and its impact on government policy, gradually removing power from the people and placing it in control of an oligarchy. The general concept of checks and balances is based on the observation that many people behave selfishly and seek to enhance their own wealth and power at the expense of others. Lord Acton's quotation, "power corrupts, and absolute power corrupts absolutely" is taken as a truism in political science today. The attempt to abuse one's position of power is not limited to outright use of force, but applies to human relationships throughout all levels of society and in all social organizations from the nuclear family, to cultural institutions, business arrangements, corporations and governments. In traditional face-to-face communities, where all people live closely together, abuse of power is usually transparent because every member of the society sees what everyone else has and knows how they got it. However, in large-scale and less personal social institutions, like a government, a church, or a corporation, people are less aware of whether each person is performing his job selflessly, or selfishly seeking to enlarge his wealth or power at the expense of others. The attempt to abuse one's position of power is not limited to the outright use of force, but can include tactics to manipulate information or money, such as secret meetings and documents, bank accounts controlled by a single individual, restricted access to prisoners, passing self-serving laws, controlling information, and other methods of hiding truth or manipulating others. The majority of the world's people throughout history have lived under the shackles of a rule in which they had very little say. Most kingdoms and political territories have been secured by force of conquest, and people living in that area were subject to the decrees of the ruling family. The classic fairy tale is a dream of marrying the handsome prince, because there was no way to acquire wealth apart from joining the royal family is based on the assumption that absolute power and wealth reside with the king. The regimes of some kings have been benevolent and others tyrannical; it has generally depended on their good will and skill. Ancient democracies, without checks and balances, degenerated into a "tyranny of the majority," so that prominent philosophers like Aristotle and Thomas Aquinas considered democracy to be among the worst forms of government. Modern democracies can provide freedom for citizens and protect rights of minorities because of checks and balances on power. Checks and balances on power begin with the assumption that any person might abuse power, and that any good leader might turn bad. Therefore, measures are established to guarantee all people potentially affected by the decisions of an individual or group have (1) an input in the decision, (2) veto power over the decision, or, (3) legal protection from injury as a result of the decision. In a small group, a leader can simply gather all members of a group together and ask for their opinions about a decision and then try to make the best decision based on all of the facts. In a larger organization, this is accomplished by representation. In a state, representation of the interests of each citizen is necessary for him or her to view the government as legitimate. "Taxation without representation" was a rallying cry for the American revolution. In an economic corporation, the financial interests of all stakeholders must be represented to secure their participation. Even in a family decision like an arranged marriage, the future brides or grooms must feel that their parents are representing their best interests. Veto power is a method used to prevent any legislation that might impact a member of an organization negatively from being enacted. In the United Nations Security Council, the five major powers each has a veto power on security operations which would commit their armies and resources to an action that would negatively affect their own national interest. In Ancient Rome, the Tribunes who represented the common citizen had veto power over legislation by the Senate to prevent legislation by the wealthy that would not serve the interests of the general population. Legal protection from injury is a form of recourse one who has been wronged by an authority can take. Such protections have been built into successful law codes since before the Code of Hammurabi. National Bills of Rights and International Human Rights are expressions of the rights all people have for protection against abuse of power by governments or individual people. To guarantee the cause of justice and legitimacy, such legal protection must be available without excessive costs or legal hurdles so that it is actual protection and not a masquerade for protection. In history, many societies have attempted to rely on moral authority as a check on the abuse of power. However, moral authority relies on the conscience of the actor and does not involve force unless the moral law becomes legislated. The most widely known example of of the relationship between moral (or spiritual) power and the temporal power of the state is the relationship between church and the state in the Holy Roman Empire. In 325 C.E., Emperor Constantine I proclaimed Christianity the official religion of the empire in a attempt to bring social stability, because Christian morality was considered a support for Roman law. In 392 C.E., all other "pagan" cults were forbidden by an edict of Emperor Theodosius I. Islam followed the same pattern with the concept of Dar-el-Haarb, which is a non-Muslim territory and the Dar-el-Islam, which is a Muslim territory. History has taught two lessons from these experiments: (1) That morality not backed by force will be ignored by power hungry and ruthless people, and (2) that morality backed by force is a form of oppression of the human mind and soul. "A man convinced against his will is of the same opinion still," is a common saying which reveals the fallacy attempts to legislate morality. In a free society, the majority of people must be able to regulate themselves, care for themselves, and produce more than they consume. In short, they must contribute more than they take. A society in which more people take than they give will be like draining a reservoir, and once the resources are depleted it will collapse. The self-regulation of people is the role of morality, character, knowledge, and skill. These things are not legislated but taught and learned, believed and lived. This is the power of a free society, and it is distributed among all responsible citizens. The absence of the self-regulation is the absence of democratic power. A democratic society cannot exist solely by creating the legal machinery of a democratic state, such as a freedom of religion, freedom of the press, and the right to vote. The absence of positive democratic power which manifests itself through self-motivated and self-regulated citizens will lead to a power vacuum which will be filled by despotic rule. Even though the power of self-motivation and self-regulation is necessary for a free society, it is not sufficient. Such power will inevitably seek to expand if it is unchecked by other power. Therefore, both self-regulation and checks and balances are required for a society or institution which all members will consider legitimate. The separation of powers (or trias politica, a term also coined by French political thinker Charles Montesquieu) is a model for the governance of the state. This same principle is applied in non-political realms under the term separation of duties. The separation of powers also serves to diversify power according to function and interest. Just as the human being consists of many organs working together harmoniously, a complex society has many functions best performed by various social organs. Thus separation of powers is a combination of functional decentralization as well as a method of checks and balances. When employing a system of checks and balances for governmental action to be processed, it must pass through what has been called the Montesquieuian gauntlet. In a system of government with competing sovereigns (such as a multi-branch government or a federal system), "checks" refers to the ability, right, and responsibility of each power to monitor the activities of the other(s); "balances" refers to the ability of each entity to use its authority to limit the powers of the others, whether in general scope or in particular cases. Keeping each independent entity within its prescribed powers can be a delicate process. Public support, tradition, and well-balanced tactical positions do help maintain such systems. Checks and balances makes sure one branch is not too powerful. The early Roman Republic was governed by wealthy land owners who formed a ruling class. They took turns serving as Senators in government, and also were in charge of military leadership for the protection of the republic. Common people, or plebeians, in the Republic served the ruling class as laborers, builders, soldiers and many other necessary jobs. However, the Senate frequently passed laws that advanced the interests of the ruling class at the expense of the plebes. Finally, the plebes in the military, realizing they were an essential part of protection of Rome, went on a strike, pledging not to work for a country that did not protect their interests as well as that of the ruling class. This led to the creation of a set of laws, known as the Twelve Tables, which governed all Roman citizens equally and the creation of Tribunes who had the power to veto any legislation that was against the interest of the plebes. This political mechanism was a check and balance which prevented oppression of the ordinary citizens by the ruling class. The justice that was created in the Roman Republic was admired by people through the Mediterranean. In the early days of the Roman Republic, little military might and police power was required to expand territory or keep order because everyone who became acquainted with it clamored to join it and helped the Roman armies depose their own dictators. The checks and balances on Roman Rule in the early republic were, thus, several. The ruler served at the pleasure of the Senate, which was made up of the landed class. The Senate, in turn, had its power checked by the Tribunes. Finally, all citizens were subject the the principles of justice spelled out in the Twelve Tables. The decline of the Roman Republic developed over centuries as corruption, political ineptness, and a lax citizenry allowed for behavior unthinkable at the founding. Reforms by Julius Ceasar, while initially restoring many of the moral virtues and laws of the early Republic, ultimately led to near absolute power for the Emperor and, under the corrupt and inept regimes of Caligula, Nero, and others, the rule of law was no longer considered legitimate by Roman citizens. Rather than clamoring to join the Empire, people sought to revolt and escape its oppressive rule. The Magna Carta was the most significant early influence on the long historical process that led to the rule of constitutional law today. It was originally created because of disagreements between Pope Innocent III, King John, and his English barons about the rights of the King. The Magna Carta required the king to renounce certain rights, respect certain legal procedures and accept that "the will of the king could be bound by law." The Magna Carta was not, as popularly believed, the first document to limit the power of an English king by law (it was partly based on the Charter of Liberties) that was designed to limit the power of the king (it mostly did not in the Middle Ages). It was not a single static document, but a variety of documents referred to under a common name. It was renewed throughout the Middle Ages, and further during the Tudor and Stuart periods, and the seventeenth and eighteenth centuries. By the early nineteenth century, most clauses had been repealed. 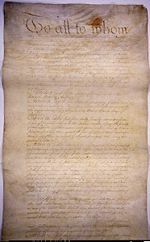 The influence of Magna Carta outside England can be seen in the United States Constitution and Bill of Rights. Nearly every common law country with a constitution has been influenced by Magna Carta, making it one of the most important legal documents in the history of democracy. Separation of powers has not been a prominent part of the political thought of the United Kingdom since the eighteenth century. The Executive is drawn from the Legislature, and is subordinate to it. Since the Executive is drawn from the leadership of the dominant party in parliament, party discipline often results in a de facto situation of Executive control of the Legislature, although in reality MPs can reject their leadership and vote against them. The House of Lords is the highest court of appeal for civil matters in the United Kingdom and for criminal matters for England, Wales and Northern Ireland. These appeals are heard by Lords of Appeal in Ordinary (Law Lords) who, in effect, are a committee of the House of Lords. This means that the highest court of appeal is part of the House of Lords and thus part of the legislature. At times, various Home Secretaries have taken decisions which in other countries are judicial, such as the release, or continued detention, of prisoners. Thus, it can be seen that in the United Kingdom the three "powers" are not separated, but are entwined. However, this has never threatened British civil government. In contrast, many countries which have adopted separation of powers (especially in Latin America) have suffered from instability (coups d'etat, military dictatorships). Some observers believe that no obvious case exists in which such instability was prevented by the separation of powers. Parliamentary sovereignty is the concept in British constitutional law that a parliament has ultimate authority over all affairs of government, including the monarch and the courts. In theory, this seems to be in direct opposition to the concept of separation of powers. In the British system, however, there is a considerable amount of de facto independence among agents exercising various functions, and Parliament is limited by various legal instruments, international treaties, and constitutional conventions. The Crown has distinct functions in its different spheres. Curiosities—such as the Lord Chancellor having an executive, legislative, and judicial role; and the House of Lords being a legislative chamber, but including some senior judges—are in the process of reform. The Constitutional Reform Act 2005 seeks to bring stronger separation of powers to the British system. Some have defended the current system on the grounds that it discourages judges from making law by judicial rather than legislative means. In recent years, there has been talk of the creation of a supreme court. Although it will not be sovereign as in America, it will help to cement the separation of powers as there will no longer be a Lord Chancellor who is a member of the executive, legislative, and judicial branches of government. In drafting the United States Constitution, the framers included features of many novel concepts including hard-learned historical lessons about checks and balances on power and the then-new concept of the separation of powers. Similar concepts were also prominent in the state governments of the United States. As colonies of Britain, the founding fathers felt that the American states had suffered an abuse of the broad power of the monarchy. As a remedy, the American Constitution limits the powers of the federal government through several means, in particular by dividing up the power of the government among three competing branches of government. Each branch checks the actions of the others and balances their powers in some way. The independence of the executive and legislative branches is partly maintained by the fact that they are separately elected, and are held directly accountable to the voters. There are also judicial prohibitions against certain types of interference in each others' affairs. Judicial independence is maintained by life appointments, with voluntary retirement, and a high threshold for removal by the legislature. The accusation of judicial activism has been leveled at some judges, and that the power restricted to interpretation of law is too frequently abused, as the Court uses its power to create laws. The legal mechanisms constraining the powers of the three branches depend a great deal on the popular sentiment of the people of the United States. Popular support establishes legitimacy, and makes possible the physical implementation of legal authority. National crises (such as the Civil War, the Great Depression, pre-Pearl Harbor World War II, the Vietnam War) have been the times at which the principle of separation of powers has been most endangered, through official "misbehavior" or through the willingness, for fear of security, of the public to sacrifice checks and balances to decisive leadership by the president. Although each branch has frequently sought to overstep its power, the separation of powers, together with checks and balances, has created a relatively stable government since the founding of the republic. The system of checks and balances is to some extent a deterrent because any power grab is undermined by the ability of the other two branches to take corrective action. This is intended to reduce opportunities for tyranny and to increase the general stability of the government. However, as James Madison wrote in Federalist 51, regarding the ability of each branch to defend itself from actions by the others, "But it is not possible to give to each department an equal power of self-defense. In republican government, the legislative authority necessarily predominates." Bicameralism was, in part, intended to reduce the relative power of the legislature, by turning it against itself, by having "different modes of election and different principles of action." The original reason for two houses in the legislature, was to balance the interests of the states and the interests of the people. Under the original constitution, state legislatures appointed the two senators from each state, while the general population elected representatives. This would enable, at least in theory, the long term interests of the states to be balanced against the immediate wants of the people. Since federalism was a union of states, the Senate would be the forum in which the states were represented. It would also serve as a check against "mobocracy," or as a way to keep the citizens from destroying themselves as in many past democracies. Thus, in theory, no legislation would pass unless it was both (1) good for the state and (2) good for the people. This check and balance was circumvented by congressional procedures and the Seventeenth Amendment. At the constitutional convention, Benjamin Franklin and General Pinkney argued that, as in ancient Rome, the Senate should be made up of the wealthy classes and receive no compensation for their service. The House of Representatives would promote the interests of the common citizen. This method of checks and balances would provide, as in the early Roman Republic, confidence that no legislation would be passed unless it was in the interest of both the wealthy and the ordinary citizens. The Seventeenth Amendment advocated having the people elect Senators rather than them being appointed by the states. It was promoted beginning in the 1870s by populists and later by progressives. Populists wanted more direct representation in the Senate, even if that would not be a check against "mobocracy." Progressives, on the other hand, wanted a stronger Federal government and to reduce the power of the states. The idea also interested lobbyists who could concentrate efforts in Washington rather than in all the state capitols. There were numerous instances state legislatures had failed to fill vacancies, and often selection was raucous and contentious. Populists in Oregon and several other states elected representatives that would push the Amendment, which finally was passed in 1911. After the passage of the Seventeenth Amendment,representatives of both houses became elected by the same interest group (the citizens) and the main difference between Senators and members of Congress was reduced to the size of the population they represented and the length of time they served. However, these distinctions are minimal and thus, the original reason of founders for the creation of two houses was largely undone. Massachusetts had already tried a similar arrangement in its two houses before the Constitutional Convention of 1787, and there it had been argued that, if such an arrangement were established, the legislative branch might just as well be unicameral. Today well-funded lobbyists in Washington arguably have greater influence over legislation than the states as a result of the loss of state-appointed Senators. One reason that the two-house system fails to represent the will of the citizens is a conflict of interest in the way the representatives and senators are paid. Congress has the power to set its own wages and also the power to tax citizens to pay themselves. There is no built-in check and balance. Once elected, members of Congress feel less obligated to represent the interests of those who elected them, because their financial support is not determined by those they are supposed to be representing. This issue was also debated at the Constitutional Convention, with several delegates suggesting there should either be no pay, or that salaries should be paid by the states that sent them. Others, including John Madison, argued that this would not provide the federal government enough independence from the states. Finally, special-interest legislation has outstripped legislation representing concerns of the majority of the population because of the technique of combining legislation, something Jefferson strongly opposed and hoped would never happen. He became alarmed about this even before his death. 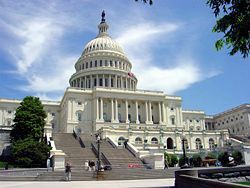 Congress devised ways to attach items to bills that might only be in the interest of one person, and never be approved a majority of Representatives or Senators as stand-alone bills. However, they are attached to bills as "pork" or lumped together in combined bills. This process, which is a procedural corruption of Congress that the Supreme Court failed to check, undermines the principle that legislation should represent the will of the people. Due in part to the Republic's youth, the relationship between its executive and legislative branches are poorly defined. An example of the problems this causes is the near complete political paralysis that results when the president, who has neither the power to veto nor the ability to dissolve the legislature and call new elections, cannot negotiate with the legislature when his party is in the minority. The federal government of the United States is a very large bureaucracy, and due to civil service rules, most mid- and low-level employees do not change when elected officials take office. Moreover, semi-independent agencies (such as the Federal Reserve or the Federal Communications Commission) may be created by the legislature within the executive, which exercise legally defined regulatory powers. High-level regulators are appointed by the President and confirmed by the legislature, and must follow the law and perhaps certain lawful executive orders. But they often sit for long, fixed terms and enjoy reasonable independence from other policy makers. Civil servants and regulatory agencies promote continuity and resist change, balancing the enthusiasm of many newly elected officials that promise swift and dramatic change, and forcing compromises that blend continuity with change. The press has also been described as a "fourth power" because of its considerable influence over public opinion (which it wields by widely distributing facts and opinions about the various branches of government). Public opinion in turn affects the outcome of elections, as well as indirectly influencing the branches of government by, for example, expressing public sentiment with respect to pending legislation. The press is also sometimes referred to as the Fourth Estate, a term of French origin, which is not related to the modern three-branch system of government. Originally, the First Amendment of the United States Constitution explicitly guaranteed freedom of the press only against interference by the federal government. Later this right was extended by the United States Supreme Court to cover state and local governments. Traditionally, the press has been the "voice of the people" keeping government somewhat in check. Press reporters are suspicious of any attempt by people with power to conceal information and view each case of secrecy as an opportunity to break a major story. An example of the press checking abuses of power was Watergate scandal; where two Washington Post reporters exposed government corruption and cover-up at the highest levels. This exposure caused many individuals to either resign, be fired, or prosecuted. However, the freedom of the press, when taken as an absolute right, prevents checks and balances on the "fourth estate." For example, within the last decades large Media conglomerates with specific economic interests often suppress potential stories that would expose corporate collusion with government that would negatively impact their stock value. This has been accomplished by the mergers and acquisitions of many News entities causing the loss of their autonomy and impartiality. The large conglomerates have lobbyists who favor certain candidates, whose weaknesses and misdeeds they are reluctant to expose. This has caused a deterioration of the role of the media as a "voice of the people." Religion, popular music, films, and schools all analyze and promote ideas which promote freedom from absolute government power. These institutions can help inform citizens when decisions need to be made about what should be done and they can seek to elect candidates that support these reforms. However, these institutions also have economic needs which are affected by positions they take, so they are not usually neutral. For example, criticism of certain government officials could lead to reduced funding, or promotion of ideas that are not pleasant in movies and books often causes economic failures that can ruin the company. The states in the United States tend to mirror the executive/legislative/judicial split of the federal government, as they were designed with a similar philosophy. Major cities tend to do so as well, but at the local and regional level governments vary widely. Because the judicial branch is often a part of a state or county government, the geographic jurisdiction of local judges is often not coterminous with municipal boundaries. In many American states and local governments, executive authority and law enforcement authority are separated by allowing citizens to directly elect public prosecutors (district attorneys and state attorneys-general). In some states, judges are also directly elected. Many localities also separate special powers from their executive and legislative branches, through the direct election of police chiefs, school boards, transit agency boards, park commissioners, insurance commissioners, and the like. Juries (groups of randomly selected citizens) also have an important role in the check-and-balance system. They have the sole authority to determine the facts in most criminal and civil cases, acting as a powerful buffer against arbitrary enforcement by the executive and judicial branches. In many jurisdictions they are also used to determine whether or not a trial is warranted, and in some places Grand Juries have independent investigative powers with regard to government operations. However, over the last fifty years lawyers and judges have managed to pass legislation that reduces the role of the jury and leaves court results more up to the skill and financial resources of lawyers. The large size of corporations and their ability to influence governments was unforeseen by most of the U.S. founders. Corporations and banks were looked upon with great suspicion for decades after the American Revolution. Many states limited corporate charters to twenty years and held them on a tight leash and national banks were not firmly established until the Civil War. The railroad and heavy industrialization during the nineteenth century created financial interests that sought to protect their interests and expand their power through the Republican Party that was formed in 1854, with Abraham Lincoln, who was a lawyer for the Illinois Railroad, one of the chief architects. By the 1870s, the Supreme Court was largely composed of former corporate lawyers, favorable to corporate growth. Numerous decisions in the last quarter of the nineteenth century, such as Santa Clara vs. the Railroad (1886), enabled corporations to achieve indefinite charters, many legal rights like individual citizens (in some cases more rights, like the ability to effect a hostile takeover), and a higher degree of independence from state regulations. Their increased status led to greater wealth, lobbying power, influence over government policy. In 1890, industry put pressure on the government to build a navy to protect the shipment of commercial goods and secure overseas markets. This was the origin of the "gunboat diplomacy" which seized Cuba, Puerto Rico, the Philippines, and other ports. There were no checks and balances in place to prevent this arbitrary use of force in U.S. foreign policy. Because corporations have been seen as important organs of economic growth, producing abundant goods for people at low prices, they have been often viewed as a new source of human salvation. This is parallel to the development of the modern state, which was also viewed as a savior, but unchecked would become a Leviathan. However, the propensity to accumulate power and the need for checks and balances applies to the commercial sector of society as it does government. Mergers, acquisitions, stock market speculation, and unbridled greed all work against the free market, protection of workers, and payment of taxes. After the Stock Market Crash of 1929 and the bank failures of the 1930s, the Securities and Exchange Commission (SEC) was established, and numerous bank regulations and accounting procedures were put into place to check and balance abuses of financial power. The expansion of excessive regulation in the 1960s and 1970s caused economic slowdown and high levels of inflation in the late 1970s. This was followed by deregulation which removed some necessary checks and balances on mergers, acquisitions, accounting standards, conflicts of interest, monopoly, and corporate oversight. The result was a wave of scandals, like Enron and WorldCom, in which highly paid corporate executives raided, stole, and destroyed companies, employees, and pension funds for short term economic growth or personal financial gain. Checks and balances on economic power must be a vigilantly applied as on political power. Checks and balances are an essential component to prevent abuse of power in any social institution. They are essential for protecting the freedom of individuals. The success of the Constitution of the United States has led to its being held up as a model for other nations. However, checks and balances, separation of powers, of other features on the U.S. Constitution worked because people were self-motivated and self-regulated. Attempts to apply similar political structures in Haiti, Iraq, and elsewhere have failed because the underlying cultural and economic conditions were not present. In the United States, and other highly developed societies, new accumulations of power, especially in the economic sector threaten the existence of democracy, and ultimately economic development itself. These accumulations of power which did not exist, or were not anticipated by the founders, must be checked and balanced with the seriousness in which the U.S. founders framed the Constitution. Today, the concentration of power in the hands of CEOs of large corporations is sometimes comparable to the concentration of power in the hands of kings in the eighteenth century. Further, checks and balances which were planned and undermined by later legislation, like the Seventeenth Amendment, prevent the smooth working of government. The failure to create a system of checks and balance analogous to the early Roman Republic which guaranteed that legislation would not pass unless it was in the interests of both the wealthy class and commoners has caused vicious culture wars in which all interest groups seek to control the government rather than remain content with a system of representation that guarantees they will not suffer abuses of power as other interest groups funnel resources into their own coffers. ↑ Gordon L. Anderson, Philosophy of the United States: Life Liberty and the Pursuit of Happiness (St. Paul, MN: Paragon House, 2004, ISBN 1557788448), 37. ↑ Gordon L. Anderson, Philosophy of the United States: Life Liberty and the Pursuit of Happiness (St. Paul, MN: Paragon House, 2004, ISBN 1557788448), p. 119. ↑ www.fpri.org, Taiwan paralysis. Retrieved June 9, 2008. ↑ John F. Molloy, The Fraternity: Lawyers and Judges in Collusion (St. Paul, MN: Paragon House, 2004, ISBN 1557788413). ↑ Alfred T. Mahan, "The United States Looking Outward," Atlantic Monthly (Dec. 1890): 816-824. ↑ Kenneth Gray, et. al. Corporate Scandals: The Many Faces of Greed (St. Paul, MN: Paragon House, 2005, ISBN 1557788383). History of "Checks and balances"
This page was last modified on 4 May 2015, at 20:31.